Around Thanksgiving time, I once again had the opportunity to visit Wright Patterson Air Force base in Dayton, Ohio. Unlike my first trip in 1985, I did not arrive on a GM corporate jet in the company of veteran executives and whisked away by chauffeurs to the local Holidome, where we immediately indulged in some corporate bonding courtesy of the hotel’s very liberal Happy Hour policy. No, this time I drove myself along with a couple of Boy Scouts to an area at the north edge of the base where we pitched our own tents at midnight for a weekend campout. Though, I don’t do much winter camping any longer, I wanted to get back to WPAFB and see the SR-71 Blackbird that inspired the original GTA. Moreover, in the back of my mind, I secretly wanted to pretend that GM finally realized they made a mistake, and decided to resurrect the Pontiac brand with an all-new GTA, and it was my job to come up with some ideas. If you followed the automotive press this past summer then you already know that the SR-71 has been cited as being the influence for at least two custom cars. Ironically, both were Ford products. I guess the Ford folks know a good idea when they see one; even if it was previously applied successfully by General Motors. 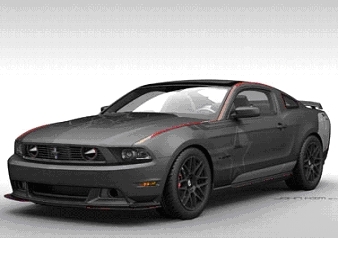 In July, Carroll Shelby joined forces with Jack Roush to create a one-of-a-kind SR-71 Mustang Blackbird. After being on display at a few venues, the vehicle was auctioned off for the benefit of EAA Young Eagles, a youth aviation organization for $375,000. 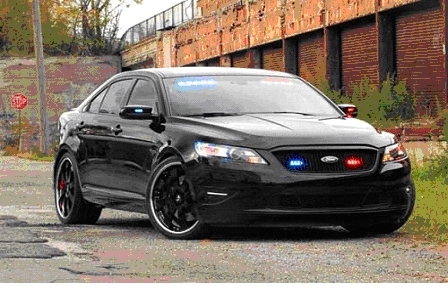 Knowing they were onto something, Ford designers and engineers came back in November at the SEMA show with an SR-71 Taurus Police Interceptor. With this vehicle, Ford took the additional step of actually using ‘stealth’ design tricks to disguise the true identity of the vehicle so it could more easily sneak up on the bad guys. Well, maybe it didn’t have all the diversionary tricks of James Bond’s Aston Martin, but it certainly stays true to the covert nature of the SR-71 airplane. As most amateur auto historians know, aviation inspired automobile concepts are nothing new – Cadillac tailfins were said to have been based on the rear of the P38 Lightening; all three GM Motorama Firebirds looked like they were ready to take off from the nearest runway; and more recently, we learned that Saabs was born of jets. You may recall from my previous article, I did not visit WPAFB in 1985 with the express intent of finding a concept theme for the GTA. It just … sort of … happened. This time, I was purposely trolling for ideas as I the meandered through the expansive exhibit halls at WPAFB. As I took in the magnificent collections, I kept asking myself, “Which of these aircraft would best epitomize a new GTA ? 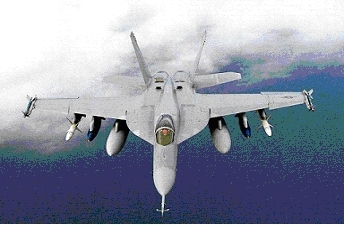 Would it be one of the more conventional fighters like the F-18 ? One could easily imagine a new GTA with this theme – styled with maximum aerodynamic efficiency in mind and built for ultimate performance and handling (and firepower !). Perhaps it would be one of the stealth fighters like the F-117A or the F-22A. The complex design surfaces on a GTA would certainly draw attention to the exterior styling. Instead of avoiding police attention, this type of car would probably end up attracting it in droves. Maybe the old NASA X-15A would hold a key? After all, this legendary rocket-engined winged aircraft was the considered the original Muscle Plane. On second thought, with its unmatched straight line acceleration, the X-15A would probably be more of a GTO concept. 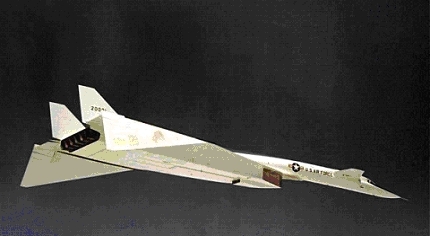 If one wanted to make a wild appearance statement, imagine a GTA resembling the XB-70 “Valkyrie” bomber: A long lean body with a V12 engine and SIX exhausts ports coming out the middle of the rear fascia. Neat idea, but the overall styling was too over-the-top. The Boeing Bird of Prey is a technology demonstrator used to test "low-observable" stealth techniques and new methods of aircraft design and construction using single-piece composites, "virtual reality" computerized design and assembly, and disposable tooling. The secret project ran from 1992 to 1999, and the aircraft first flew in the fall of 1996. The Boeing Bird of Prey demonstrates advanced stealth concepts, notably its "gapless" control surfaces that blend smoothly into the wings to reduce radar visibility, and an engine intake completely shielded from the front. The Bird of Prey, however, used some "off the shelf" technology to reduce costs and speed production. That was it! Use a Boeing prototype concept to form the basis for the new GTA. In fact, I even gave it a nickname: The Pontiac Firebird of Prey. More irony here: Ford CEO, Alan Mulally is an ex-Boeing executive. I wouldn’t be surprised to see a couple of 2011 Ford concept cars claiming to have been inspired by the Boeing Bird of Prey. In addition to the Boeing Bird of Prey’s smaller size and unique styling cues, a couple of its non-product features also caught my attention: it was used to validate new methods of design and construction and also used some ‘off the shelf’ technology to reduce costs and speed production. That’s exactly what a new GTA should be: an affordable package of innovative as well as existing goodies that push the envelope of vehicle styling, engineering, performance and roadability. Gee, it sounds a lot like the old Pontiac Mission Statement from the Division’s mini resurrection in 1981. The major criticism I have of today’s popular muscle cars (Camaro, Mustang, Challenger) is that they’re too big and heavy. Yes, they look great, but with a 500-750 lb diet, they’d look and perform even better. From a styling standpoint, a new GTA should be about 4/5 the size of these cars, and it SHOULD NOT have a retro design theme. In my opinion, a new GTA should have bold never-seen-before exterior and interior styling. The Boeing Bird of Prey look almost suggests mid or rear engine !!! The 1987 GTA was originally envisioned with a version of the Buick 3.8L V6 turbo. Unfortunately, cost and expediency reasons resulted in the 5.7L V8 being added to the program in its place. This time, I imagine a small displacement V6 with on-demand high output capability achieved through electric turbo or supercharging. In other words, the goal with be to have two cars in one: Good performance and fuel economy with low emissions for city driving, and snap-your-neck-back after-burner capability for the open road. I’m thinking ahead to the new CAFÉ rules, and perhaps avoiding any penalty for Gas-Guzzlers since the GTA’s high performance capability would be totally discretionary. Possibly, a logical argument could be made NOT to have the boosted version of the GTA included as part of the MPG calculations. On the inside, the new GTA should have all the latest driver comforts and connectivity capabilities that (will) exist. Rather than develop all these independently, perhaps a joint venture with Apple, Microsoft, Motorola or Research in Motion would be advised. In fact, make it easy to for all of them to integrate their devices with plug-and-play capability. Think about having applications to reconfigure and customize your gage clusters and comfort controls. OK, those are some of my thoughts for a new GTA. What are your ideas ? Let’s hear from you either at the GTA Source Page Forum or on the Facebook Page. Don’t worry about disagreeing with some of the ideas I’ve thrown out there. The creative process depends on healthy and vigorous debate. The time to change and improve things is before the tooling is cut. By automotive industry standards, the GTA could easily be passed off as a simple, but well-executed line-extension of the Trans Am nameplate. After all, its entire production run was under 40,000 units, and that was over six model years. Moreover, except for a chance to pace the Indianapolis 500, there was barely enough GTA news created in the mainstream media to warrant a lowly business school case study. Conventional wisdom deems that cars with such minor sales numbers and scant public attention usually don’t make much of an emotional connection with their owners and aspirants. Yet, in this internet age, the GTA has become a contrarian to this logic. To paraphrase the late writer, Elizabeth Bowen: "Everything about it was minor, but the passion it inspired". Though this column (or blog, if you will), I hope to nourish the bond between you and your GTA by taking you behind the scenes to expand on ‘the story behind the story’. My musings will be part nostalgia, part analysis, part prognostication, and as appropriate, part editorial commentary. In short, I’ll use my 28 year association with the automotive industry to give you the View From Detroit: Then…and Now. As with any new writing venture, allow me a moment to acknowledge my appreciation for several important people. To start, a big thank-you to Frankie Rider for shepherding The GTA Source Page, for over ten years now, and allowing me to become a part of it. Next, I want thank YOU, the owners and enthusiasts, for laying down your hard-earned money and devoting your valuable time to keep the GTA flame burning all these years. Also, let me introduce you to the Pontiac ‘F Car team that brought you the original GTA: Product Planning Manager: Dave Spence, Executive Engineers: Jim Lyons and Tom Goad, Chief Designers: John Schinella, Jack Folden, and Bill Scott, Product and Marketing aces: Janis McFaul, Roger Sears, Mark Alfes, Mick Pallardy and Sam Slaughter, Pontiac’s crack Public Relations staff headed by Bill O’Neill and featuring Jill Witzenburg (her husband, Gary is a terrific automotive writer); some very patient copywriters and account managers at the former advertising agency of D’Arcy, McManus & Masius, and finally, all the guys (yes, they were mostly guys) at the former Van Nuys, California Assembly Plant. Since the GTA retrospective articles appeared in High Performance Pontiac magazine three years ago, the question I’m most often asked is whether the story is true that the United States Air Force SR-71 Blackbird inspired the original GTA. Well, yes; it’s 100% true. You can’t make up stuff like that. Those of us at Pontiac in the mid-1980’s knew that there was a market opportunity for a flagship Trans Am that was positioned away from the IROC-Z, closer in appeal to intenders of the Nissan 300ZX Turbo, Toyota Supra, and Porsche 944. Now, that didn’t mean we wanted to ‘Euro-fy’ or ‘Asia-fy’ the Trans Am. That would have been a disaster. For one thing, both Pontiac and Firebird possessed a bold American heritage. The idea was to present a fresh appearance and competitive hardware package to a segment of buyers that had not previously considered a Trans Am. We understood that repositioning was a tall order since base ‘F’ Car mechanicals were not considered to be cutting edge from a technical standpoint (e.g., solid rear axle, cast iron OHV V8, etc.) Our exterior graphics theme tended to flamboyance with wide stripes, two-tones and screaming chickens. Mind you, for many of our traditional buyers, this was just fine. The new buyers we were targeting, however, tended toward something less ostentatious on their sheetmetal and something more ostentatious under it. It was a classic marketing dilemma: Chevrolet had owned the domestic sporty car segment since the 3rd Generation ‘F’ Car was introduced in 1982, and Ford, too was beginning to pour more resources into its venerable Mustang GT. Forced to share the Chevy’s underpinnings, Firebird / Trans Am was going to have a rough go of it if we stayed and tried to fight it out with Camaro / Z28 / IROC-Z. And with Chevrolet’s big budget sponsorship of the International Race of Champions as well as the iconic ‘Heartbeat of America’ advertising campaign, the best thing for Pontiac (and General Motors) was to get out its way and try something different. Working in automotive marketing gives one access to volumes of consumer research for the purpose of decision-making. It was easy then, and easier today, to become overwhelmed – the old ‘analysis paralysis’. The trick was to balance such data-driven deductive reasoning with one’s personal gut sense or intuition. In other words, getting one’s left brain and right brain to work in the correct sequence. I thought I had become pretty good at it when I worked for Pontiac, only to realize I had a lot more to learn when I decided to leave GM to start my own business, but that’s another story. What proved to be the defining inspiration for an uplevel Trans Am presented itself on the afternoon of January 17, 1985 in a warplane exhibit hanger at Wright Patterson Air Force base in Dayton, Ohio. Certainly, I’d read about and seen pictures of the SR-71 Blackbird for many years, but had never seen one in person. Talk about taking your breath away – and the darn thing wasn’t even flying. 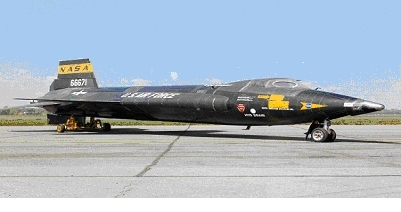 Simultaneously lean and muscular, the flat-black SR-71 wings and fuselage were nearly void of extraneous graphics. As I recall, it had only some white lettering and red striping detail; probably for safety and air refueling purposes. The sleek silhouette of the plane emphasizing those two monster jet engines spoke volumes for its mission to be the fastest and highest flying aircraft in the military fleet: Form and Function were integrated into a true aesthetic and technological masterpiece. Most importantly, the Blackbird’s visual presence carried an unmistakably American high performance character – NOT Japanese and NOT German. Instantly, I knew that the uplevel Trans Am should be the terra firma version of the SR-71.